Check out my new harness! Glogirly got it for me to see if I might want to eventually go on some outings and meet people. It just arrived yesterday, so it's all still really new to me. It wasn't very fun to put on, but once she got it all adjusted and buckled I forgot all about it and started chasing my wand toy around. She said she wanted me to associate something fun with my harness. And you KNOW how much I LOVE my wand toy! The don't call me Air Waffles for nothing! When my friend Odin from Cat Wisdom 101 found out I had a new harness, he got in touch right away. 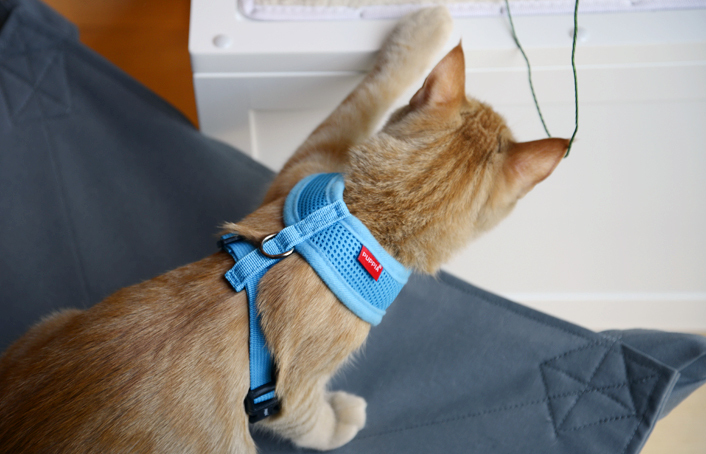 He's a very experienced harness kitty and thought it would be helpful to share some of his special tips and tricks, on account of I'm a beginner and all. Make sure you're microchipped. Actually, even if you never go outside you should STILL be microchipped. Stuff happens when you least expect it. Both me and the Boss are microchipped. I think Glogirly should get microchipped too. Start with the harness indoors. Get comfortable. Glogirly played with me and talked to me really nice. That made my harness more comfy. Add the leash indoors first. Your human can pick up the leash, but they shouldn't pull or tug. They should follow YOU around. They can use something like a Neko Fly or other wand toy to encourage you to walk around. Keep your training sessions short. Start at 5 minutes and gradually increase. Once you go outside, stay very close to home. Don't go near anything noisy like busy streets. Since we live in the city, Glogirly says she's going to look into taking me in the car to a very quiet park nearby. Have your human use a verbal cue like "outside" or "walkies." They should reward all wanted behavior and ignore the rest. Consistency is super important. You should train at the same time everyday if possible. Before mealtime is best so you'll associate your training with your noms. Commitment is super important too. It won't be long before you'll look forward to your outdoor sessions. Don't let your human be a slacker. In addition, Odin said this is a great time to practice basic training commands like Come, Sit & Stay. Glogirly says my learning curve is steep here. I don't know what that means, but I DO know that treats are involved so I'm ALL-IN. She said we're going to do a separate post about my Come, Sit and Stay training. And treats. 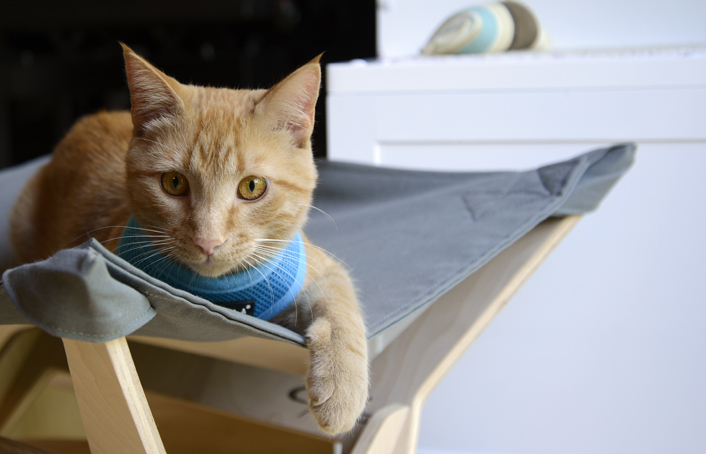 We want to thank Cat Wisdom 101's Odin & Layla for their great tips on harness training! Since we are SO not the experts here, it's awfully nice to have smart friends that can help. 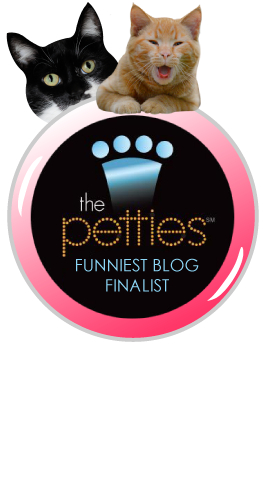 Cat Wisdom 101 is also a finalist for The Petties. They're in the Best Cat Blog category. AND, since you're probably heading over to vote... just sayin' ! Even with all these tips, I don't think I would do well with a harness - and I am so small that I could easily squirm out of just about any type! My human says she will give me a pass... but the next cat to come through these doors won't be so lucky! I have NO idea what that last part means, but I hope it is not anytime soon! Aw you look so cute in your harness! I bet you'll be a great kitty for going on walks. I really like that brand of harnesses too. I don't think I've ever seen a kitty wearing one though. We think you and GloGirly deserve lots of applause for attempting this. We older kittehz will stick to what we know: NO LEASHES. Pee Ess - we voted and maybe you could get a stroller for Katie! if the plebeians wish to see me they can make an appointment. 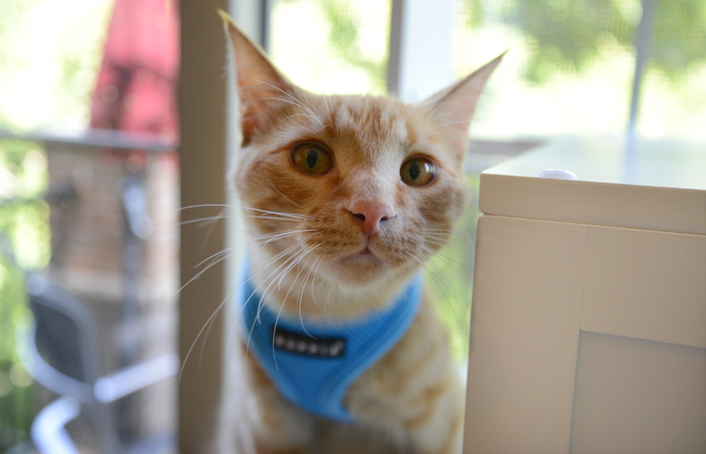 We think Waffles rocks that harness! Waffles look great in that harness! Happy walking! Our human has walked our late brothers Tortie and 4Head when they were alive! Purrs! hee hee any reason to have more treats!! You're very handsome in your harness, Waffles! It looks like you're headed for big adventures. Aw, you look cute in your little harness! Star has a figure eight harness, but she refuses to stand when it's on. We'd have to take her for a drag, not a walk.. Looks like you do better with yours! Oh, and we just saw your Air Waffles video, it was AWESOME! nice harness!!! we hope you have fun with the outside thing. mom says she wishes she had started with Mo but now says something about sailing ships. But she has walked cats at Best Friends and our foster kitten Triscuit wore hers at Blog Paws. Oh Waffles, you're going to love walkies! that is one COOL looking harness!! I used to take Bobo out on walks and believe it or not I used a CHAIN dog leash (a strong one), and a leather dog collar! I was too paranoid that he would break out of anything "cat" related. The only thing I don't like about taking a cat outdoors (unless you live in a rural area like Layla), is that they often become obsessed with the door leading to the outdoor world and are more likely to make a break for it, whereas strictly indoor cats that have had nothing to do with the outdoors are less likely to do that. Odin is very wise, those are great tips! 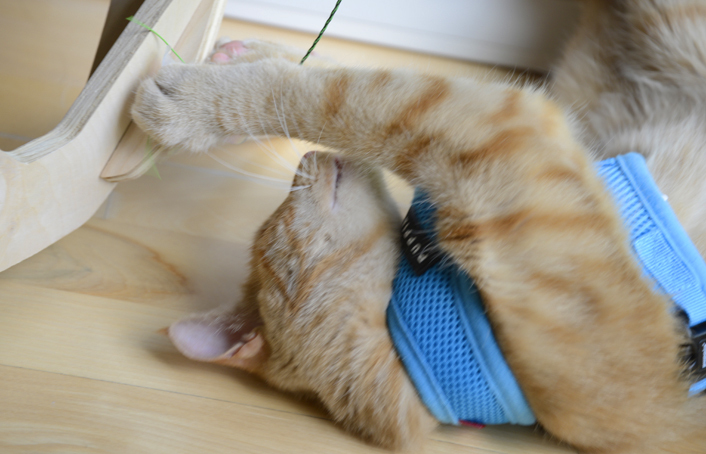 Waffles, it is a good sign that you are willing to wear the harness inside and still play. And that blue looks great on you!! Handsome kitteh! Brat & Rags don't like the whole outsideness thing, and refuse any attempt at harness. Loudly. Toothily. Blue is your colour enjoy your walkies too! Scrunch your shoulders IN just SO... then back outta the dang thing. Worked for me. Furry nice looking harness Glogirly got to you , Waffles ! The colour suit´s you purrfect ! Odin´s top 10 recommendations is furry good ! Don´t be sad cause you don´t know what Come , Sit & Stay is ! 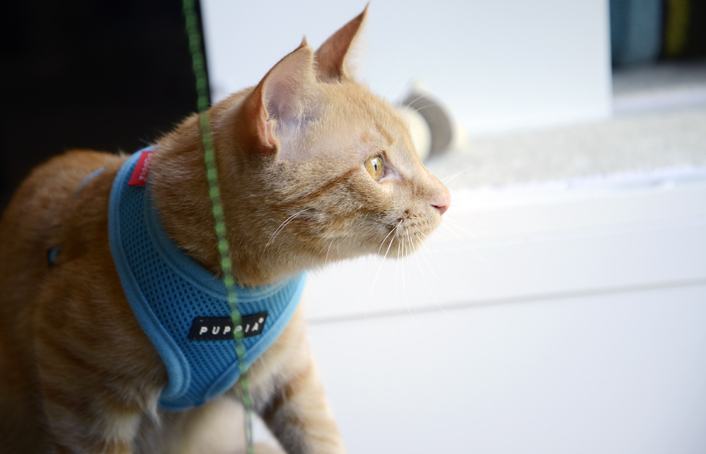 We're looking forward to your adventures outside with your harness. You look good in blue W2! Those really were great tips!!! So cute! I had a cat that walked on a harness once. If I didn't take him out on controlled walks, he'd try to escape as often as possible. He was one very curious cat. I miss my Scrapper. Waffles, that harness looks great on you. The mom wants to get me one of those. I have the regular kind of harness and it never looks comfortable on me. And trust me, Waffles, you're gonna love going outside. All I have to hear is the word "out" and I am at the door! Whoa! How hard are you laughing Katie? You get him out of the house with the hope that he might even get lost. What a wussycat. He lets the humans do whatever they want. Good boy, Waffles! That blue harness looks so handsome on you. Tabby's got a pink one like that and a pink regular harness as well. Freya & Heimdall have mesh walking jackets. Those are some great tips that Odin gave you. Follow them and you'll soon be walking outside! It's a lot of fun! Maybe you'll even be able to go visiting like Tabby does. I can't even handle this kind of cute! Waffles looks so handsome in blue! The tips are great! And kudos to Waffles for the added tip of microchipping the humans...our fur kids agree! This is the second nice harness we have seen. Word on the street is that http://www.mynwoodcatjackets.co.uk/ are tops for custom made cool jackets. Check 'em out Waffles. p.s. You look cool dude. Us outdoor cats don't use harnesses but you look pretty dynamic mate! I hate it when I have to wear mine when I go out for a walk with Mum in our back garden. Katie's got to be jealous! We likes your blue harness Waffles! It look furry good on you. But we don't thinks we'd like one. Sasha had a little one when he was little but he outgrew it and mom didn't get him another one. Plus we don'ts go outside furry much. Have fun with the training, MOL!